During the past few years, the Gwynedd Archaeological Trust has been involved in work examining the historic character of areas defined by the Register of Historic Landscapes in Wales. This is part of an ongoing pan-Wales project sponsored by Cadw: Welsh Historic Monuments, the Countryside Council for Wales and ICOMOS UK. The background to this is outlined below. It is hoped that it will be possible to consider all the landscapes in the register over the next two or three years, and then to expand the work into parts of Wales which are not included on the Register. What is historic landscape characterisation? Natural forces and human activity acting together over the last six thousand years have contributed to produce a landscape of great beauty and variety in Wales, a national asset that is essential both to our national identity and to our individual 'sense of place' and well-being. The diversity and imprint of human activity on the landscape is everywhere to be seen, from the enigmatic stone monuments of the prehistoric period and the magnificent castles and abbeys of the medieval period, to quite commonplace and typical features like field boundaries that can often be of great age. But the landscape is more than just attractive scenery or a record of the past; it also provides a place for us to live, work and sustain ourselves, through farming, forestry, tourism and so on, processes that all shape, and will continue to shape, the landscape. Recognising and raising awareness of the importance and wealth of the historic fabric of the landscape has been the central theme and message of the non-statutory, Register of Landscapes of Historic Interest in Wales, the first part of which, covering thirty-six 'outstanding' landscapes, was published in January 1998. This has been compiled as a joint initiative between Cadw: Welsh Historic Monuments, the Countryside Council for Wales (CCW) and the International Council on Monuments and Sites (ICOMOS), working in collaboration with the four Welsh Archaeological Trusts, the Royal Commission on the Ancient and Historical Monuments of Wales and the Welsh unitary authorities. A second volume of the Register, published in 2001, identifies 22 landscapes considered to be of 'special' historic interest. These 22 areas are taken to be of national significance alongside the 36 generally larger areas of outstanding historic interest identified in the first volume. The Historic Landscapes Register provides a first step, a national overview of the historic content of the Welsh landscape. The next step, so essential to the process of informing the way in which aspects of the historic landscape may be managed, is to make available more detailed information about the character of this landscape at a more local level. This is achieved through a process known as historic landscape characterisation which has been developed in Wales jointly by Cadw, the CCW and the Welsh Archaeological Trusts. This involves the identification of geographically definable and mappable areas of historic character, as determined by the range and distribution of surviving archaeological and historical features and the main types of historical land use patterns or historic 'themes' that have shaped the area. The key historic characteristics of the area are then identified along with recommendations for their positive management. It is the great depth of human activity which underpins much of what we feel is important and helps give an area its local distinctiveness. Historic landscape characterisation is, therefore, an important dimension of this approach: it sets out to identify and map the physical manifestations of past human activities which produce much of the character, distinctiveness, quality and diversity which we value in our present-day landscapes. The characterisation exercises are being undertaken by the Welsh Archaeological Trusts with grant-aid from Cadw. These studies are initially concentrating on those areas identified on the Historic Landscapes Register, although it is accepted that the whole of the Welsh landscape can be said to be, in one way or another, historic. Information is being prepared in a form which is compatible to the CCW's landscape assessment and decision making methodology, known as LANDMAP. It will be made available to a wide range of organisations and will feed into various initiatives to protect and manage the Welsh countryside, most notably the Tir Gofal agri-environment scheme. In north west Wales, LANDMAP exercises have been carried out in the local authority areas of Gwynedd, Anglesey and the Snowdonia National Park, and the results have been taken on board by the authorities to underpin such initiatives as Unitary Development Plans, countryside strategies, biodiversity action plans and so on. The Historic Landscapes Register and the characterisation exercises fully acknowledge the dynamic and evolving nature of the landscape. They promote the view that protecting the legacy of the past in the landscape is not to be achieved by preventing change or fossilising the landscape but rather by informing the process of change, creating tomorrow's landscapes without necessarily sacrificing the best of yesterday's. 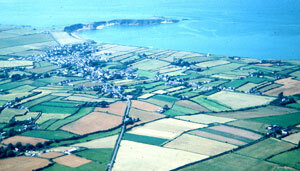 The historic landscape of Morfa Nefyn, Llyn. Medieval fields intersected by the nineteenth century turnpike road. 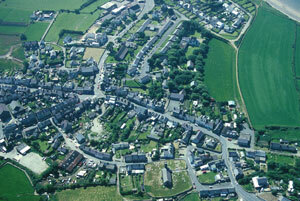 Historic settlement patterns: the pre-conquest borough of Nefyn, Llyn.